This is an excellent recipe for pumpkin soup! I have been using it for about two years and my whole family loves it! Even kids will eat this soup! 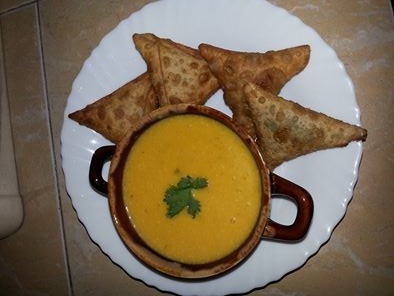 A silky textured soup, sprinkled with fresh coriander and served with samosa. Fry Onions add black pepper and salt to taste add pilled pumpkins, and water and bring to boil. Let it cook until tender. Pour in a blender and blend as you check for consistency. 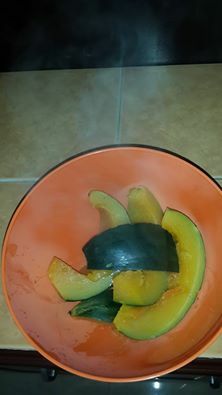 Serve in a bowl and enjoy! 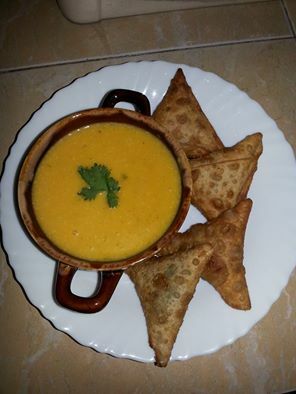 You can serve with chapati, samosa, and much more.